Northeast Wyoming is rich in wildlife. Visitors with a watchful eye are sure to see deer and antelope. Wild turkeys are also prevalent throughout the area. Pronghorn antelope are abundant on the prairies south and west of Newcastle. They’re the fastest land animals in the continental United States. The young of the year begin arriving mid to late May and are enjoyable to see. It’s amazing how quickly they learn to run as fast as the older members of the herd. 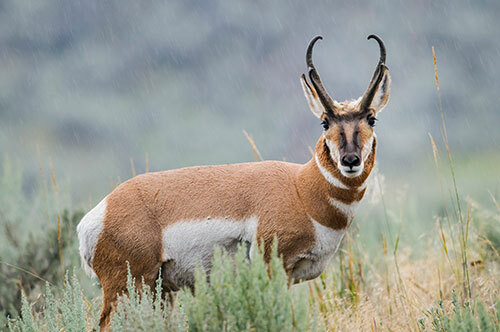 Once almost extinct, one might never guess that hte pronghorn is an American conservation success story. Both mule deer and whitetail deer are found in and around Newcastle. Mule deer are named for their larger, “mule-like” ears. Their diets are comprised of forbs, and they browse the leaves and twigs of woody shrubs. Northeast Wyoming is known for its whitetail deer. When spooked, the deer wave their tails, almost like a flag, as they depart the area. While elk are increasingly abundant within the area, they’re not seen as frequently. Keep out a watchful eye, however, as the large animals can sometimes be seen grazing the foothills and meadows throughout the Black Hills. Several smaller animals, from rabbits to coyotes, are frequently seen throughout the area. The Mountain Bluebird, bright blue in color, adds a colorful element to the countryside each spring and summer.